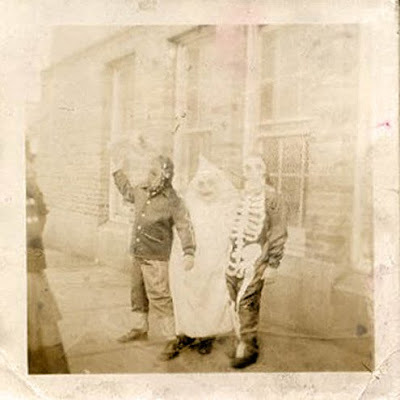 From Wired.com and by way of Flickr comes a smattering of interesting vintage Halloween photos by collector Steven Martin. Looking at what some of these deprived kids (and grown-ups) had to wear, I can now appreciate my plastic 1970s Ben Cooper costumes. What's really cool about these photos, many of which appear to have been taken during the Depression, is just how unintentionally creepy many of them are. 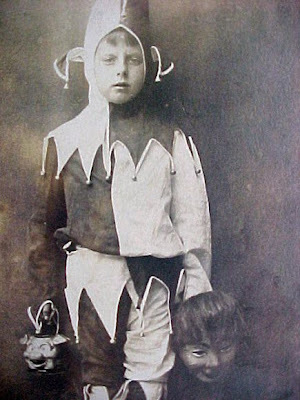 As Martin himself says, "I am really fascinated by how these photographs of people dressed in primitive, homemade costumes and memorialized in faded, black-and-white photos often seem to have a real sinister aspect to them. 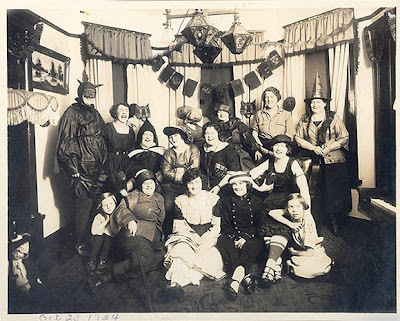 I'm not sure if it was intentional or not, but to me Halloween a century ago looks much scarier than it does now in digitalized color." This jester appears to be holding what looks like a decapitated head...or is that two heads? The plastic pumpkin shaped candy holders I had as a kid seem so innocent by comparison. 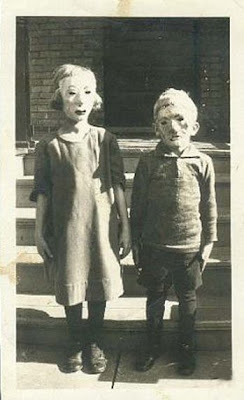 These two sorry looking tykes, who look like typical Depression kids, appear to be wearing paper mache masks. 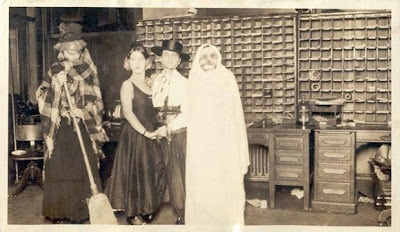 The excessive fading in this photo really adds to the creepiness factor. I don't even know what the kid on the left was supposed to be - a devil? 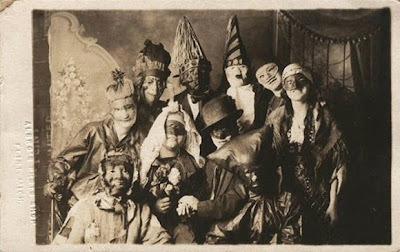 Motley crew: I would love to know what the person with the pillowcase on their head is supposed to be. Another group shot: I'm guessing that the fellow on the left is supposed to be Batman. It's interesting to note that there's very few costumes here that emulate a cartoon or pop culture character. That didn't seem to become popular until TV was invented. Note the two black cat masks or lanterns hanging in the background - I love them! Where was this Halloween party supposed to be - in a prison basement? There's more where these came from, if you click the Wired.com link at the beginning of the post. Some of those were creeeepy! Great post! oh my they are creepy - at least in the 2nd to last one they look happy. I'll never sleep again. That second image is, frankly, terrifying. Fun blog! I look forward to following. I'll add you to my side bar. Today and Yesterday: The Today Show Gets Fun-kay! Who You (Not) Gonna Call?